Trinity college is one of the largest colleges in Cambridge in terms of the number of both students and fellows, second only to Homerton college. Assessing purely in terms of undergraduate student numbers, it is the largest of all of the Oxbridge colleges. 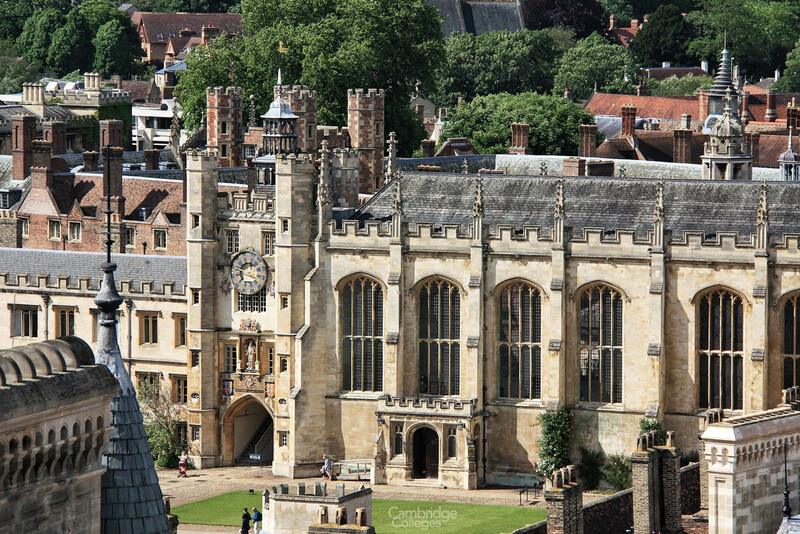 The college was established by that most infamous of English Monarchs – King Henry VIII in 1546, shortly before his death in January 1547, having been persuaded to do so by his 6th wife, Catherine Parr. 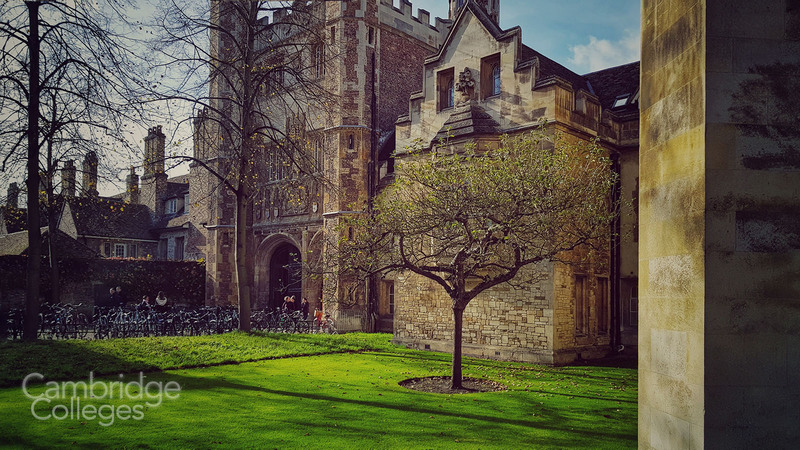 The college was established by the amalgamation of two older colleges – King’s Hall and Michaelhouse, as well as a number of other, smaller hostels (seven in total), that were part of the university at the time. The thrifty Henry VIII did this because it meant that he did not have to dip into any royal funds to establish the college. 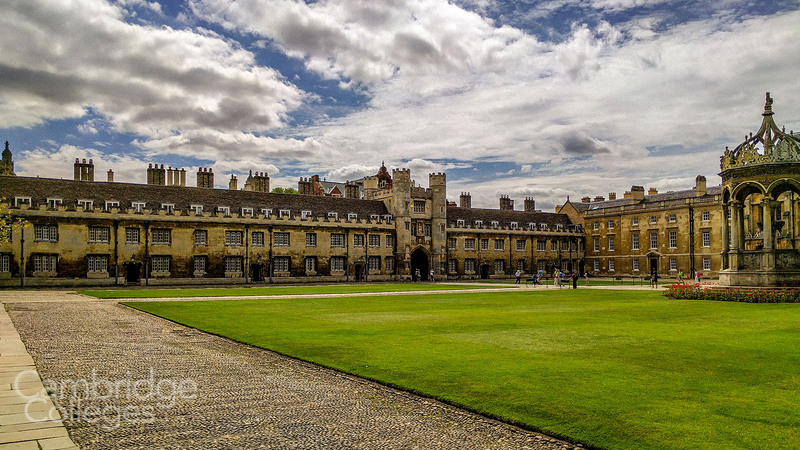 The main college campus is sandwiched between St John’s College and Gonville and Caius College. The River Cam passes through the grounds of the college, to the rear of the Wren Library. The foundation of the college explains why its older neighbour Trinity Hall has retained ‘hall’ as part of its name. Many other colleges have dropped that part of their name as they evolved over the centuries. Many people incorrectly believe the name Trinity refers to the Holy Trinity. However, it is in fact an ironic snub to the Roman Catholic church. Henry VIII was not a fan of the church, famously resulting in the dissolution of the monasteries in the UK. In addition to this Trinity owns a 50% stake in one of the UK’s largest supermarket chains, Tesco. Trinity is often spoken of as the third largest or wealthiest land owner in the UK with a wealth portfolio in terms of land assets alone that’s in the region of £1,000,000,000 (yes, that is the correct number of zeroes!). Although Trinity have such vast wealth, according to their financial FAQs this money is reinvested in maintaining the college itself, providing funding for students and also for the smaller, less financially gifted colleges. The King’s Hostel, is one of the oldest parts of the college and pre-dates Trinity college itself. Still standing to this day, it is the only piece left of the King’s Hall, along with the King’s Gate. The King’s Hostel is just to the rear of the Clock Tower. One of the most well-known sights is the Great Gate. It offers a tremendous first impression of the whole college, and the eternal crowd of photographers is testament to its appeal. 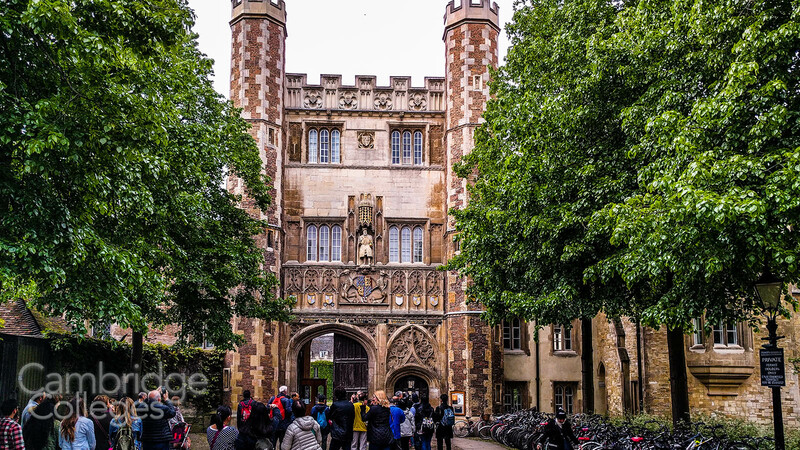 The Great Gate is generally the first feature of Trinity that students, fellows, or visitors set eyes on when arriving at the grounds of the college, facing out on Trinity street, and is the main pedestrian entrance to the college. Stood above the entrance, in a recessed area above the doorway, a statue of the founder of the college, Henry VIII greets visitors as they enter. 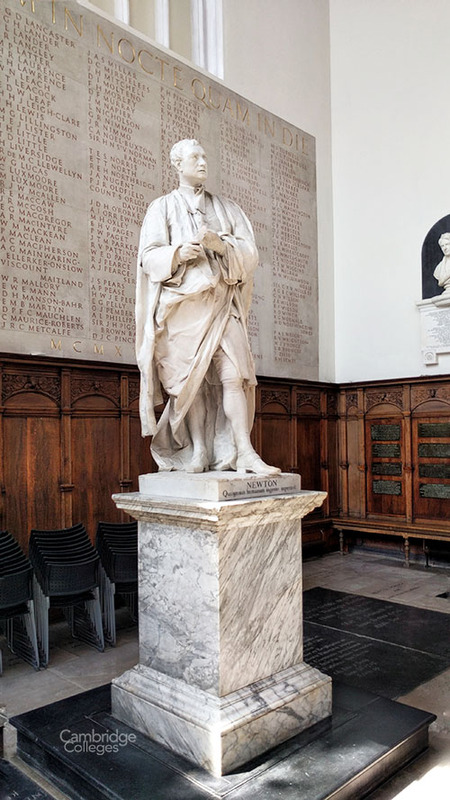 The eagle-eyed will spot that instead of a sceptre in his right hand, he is holding a wooden chair leg – placed there as a student prank many years ago and now another part of college folklore. The Great Gate seen from outside the college. Can you see what Henry is holding? The Great Gate leads to the Great Court, which is reputed to be the largest enclosed quad (courtyard) of any building anywhere in Europe. It was completed in the 1600s thanks to the then master of the college, Thomas Neville and, despite being remodelled a number of times over the years out of necessity, the Great Court has managed to preserve its historic aura. A large fountain forms the centrepiece of the courtyard. South west of the Great Gate, you’ll find the Bishop’s Hostel. The hostel was named in honour of John Hacket, the Bishop of Lichfield and Coventry. 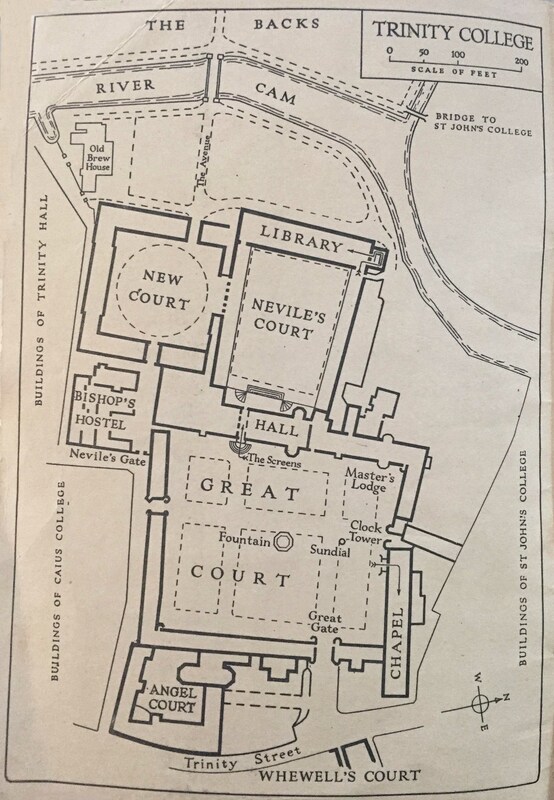 Adjacent to the Great Court is Neville’s Court, named after Thomas Neville, the college master who requested its construction. Today its Cloisters provide sheltered walkways catering to the needs of pedestrians making their way around the court. 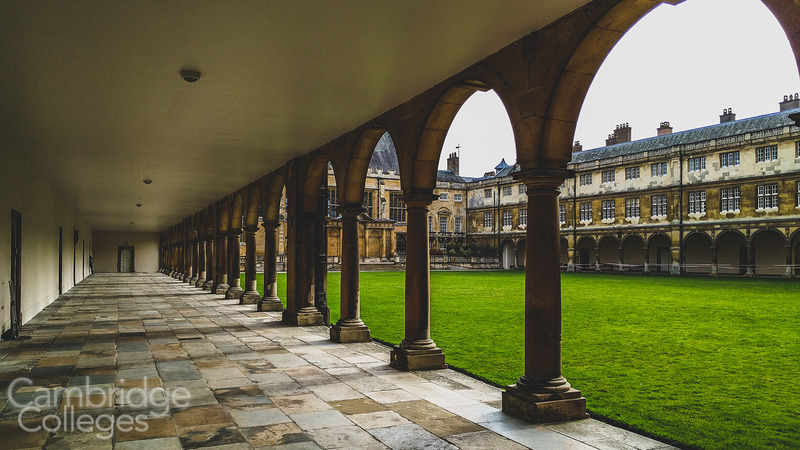 These cloisters lead to the Great Hall, college library, Wren Library and the New Court. The court was enclosed by the construction of the Wren Library at the far end, at the end of the 17th century. Tradition still plays a huge part of college life at Trinity. One of the most intriguing of which is The Great Court Run, immortalised in the film The Chariots of Fire. As the name implies, it is a run around the perimeter of the Great Court, a distance of approximately 400 yards, within the 43 seconds of the clock as it strikes twelve. Students take part in the traditional run on their Matriculation Dinner day. Do you think that you could run around here in 43 seconds? The Great Court Run is open only to freshers and they typically attempt the run wearing their college gowns. Recently the rules have been clarified to prevent students from cutting the corners during their run. It’s a challenging run, but success it not impossible. 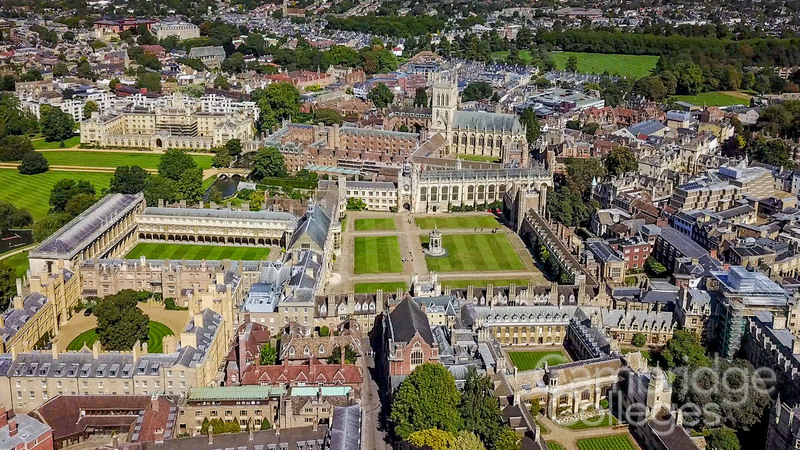 According to legend, Trinity’s clock strikes every hour twice after a successfully won wager with neighbouring St John’s College, over which college could build their clock tower faster. The clock tower in the New Court building of St John’s famously does not feature a clock. The legend goes that Trinity won the race and installed two bells in their tower in order to strike the hour first for their own students and then, afterwards, for those of St John’s. Trinity’s clock tower was built in the 17th century, some 200 years earlier than the building at St John’s. The reality is that the then master of Trinity Richard Bentley, a St John’s alumnus, ordered that the clock strike twice. Once for his current college (Trinity) and once for his alma mater (St John’s). Trinity is also known for its Open-Air concerts and the wooden Mallard in the rafters of the Great Hall. There is plenty of history and tradition for the visitor to immerse themselves in at Trinity College. As with all of the Cambridge Colleges it’s a wonderful escape from the hustle and bustle of the centre of Cambridge. 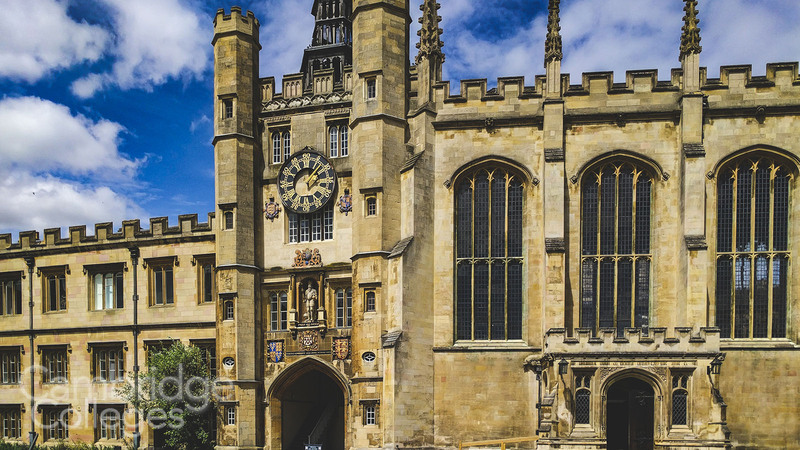 to name but a few and the college has provided no less than 32 Nobel prize winners to date-the highest of any Oxbridge college- and approximately one third of the total won by members of Cambridge University. 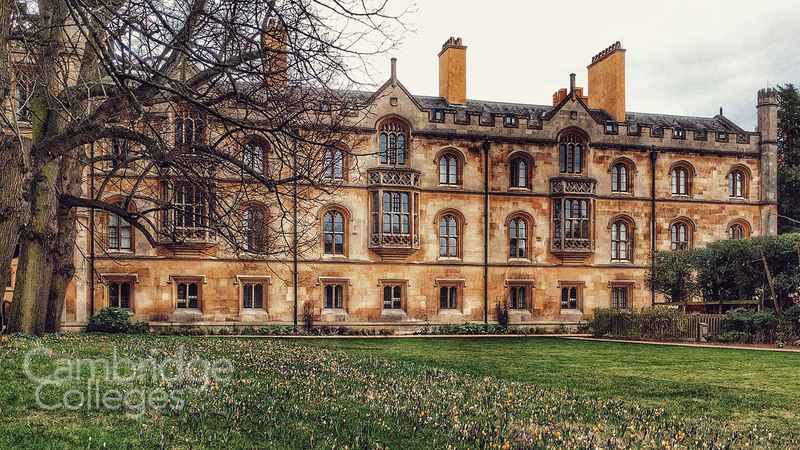 Aside from the top-notch education that Trinity college provides as part of Cambridge University, there are plenty of reasons to visit, because of the many sites of historical interest that can be found within its grounds. Trinity College’s sister college is Christchurch College, Oxford, used as a location for the filming of the Harry Potter films. Despite appearances, no filming took place in Cambridge. Just outside of the Great Gate of Trinity College and easily overlooked by the uninformed, is an apple tree. The tree is a direct descendant of the tree that is believed to have inspired Sir Isaac Newton’s discovery of gravity, taken from a cutting of that tree in Grantham, at Isaac Newton’s family home. The tree is planted beneath the windows of the rooms where Newton lived during his time at Trinity College.